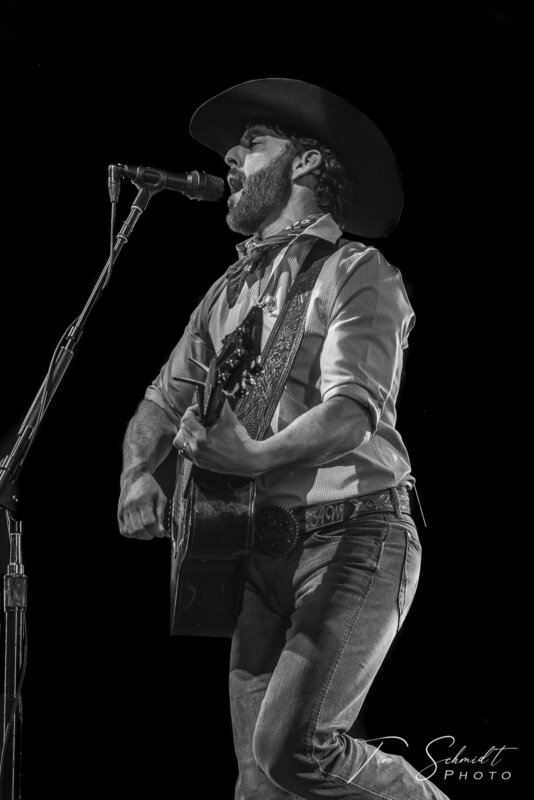 Aaron Watson continues to be one of country music’s biggest independent, do it yourself, success stories. He showed why during his sold-out show at the Knitting Factory on March 28, 2019 in Boise, Idaho. This year, 2019, marks the twentieth anniversary of the native West Texan’s musical career. Watson has made over a dozen albums and has performed more than twenty-five hundred shows in the U.S. and Europe. The consistency of Watson’s work and the loyal fan base that he has captivated throughout the years, is no easy feat in today’s music industry. Watson’s high level of professionalism and the energy within his work was on full display during his set in Boise. The show opened with Watson’s “These Old Boots Have Roots,” off his 2017 studio album, Vaquero, which debuted at #2 on Billboard’s Top Country Album Chart. Everyone was loud and on their feet as Aaron had the Factory getting down to some damn good Texas country music. Watson played a song off his anticipated July release titled, Red Bandana, that kept the place alive and shaking. The song, “Kiss That Girl Goodbye,” was released on January 4, 2019 and has already become a crowd favorite as was evident from the live version that was performed at the Knitting Factory. Towards the end of the show, Watson and the band played “Outta Style” which is also off the record, Vaquero. The tune had everyone living and believing in the moment of right here and right now. The song, which was written by Watson, hit the Top 10 on the Billboards and was his first widespread release to be played on national radio. “Outta Style,” earned Watson his first ever BMI Award as one of the fifty most played country songs of 2018, making it the only one hundred percent, self-penned, solely published song to receive the honor. Aaron Watson is set to release his much-anticipated album, Red Bandana, on June 21st of this year. His single, “Kiss That Girl Goodbye,” has already wrapped up over two and a half million views. The album will consist of twenty, power packed, songs that are rumored to play off each other just like “Clear Isabel” plays off “Mariano’s Dream” on his 2017 production, Vaquero. That’s right! Twenty songs playing off each other with Watson’s songwriting talents fanning the flame. Watson has said that “…this is his favorite body of work ever…” and will be released on his very own Big Label Records and will be distributed by ADA Worldwide.